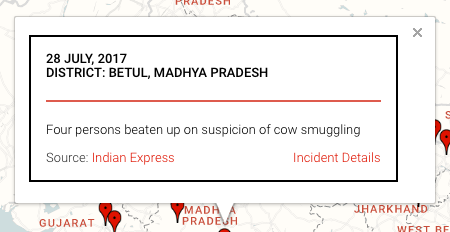 After the recent murder of a dairy trader by cow vigilantes on the Rajasthan-Haryana border, 11 deaths have been reported in 2017, the highest toll from cow-related hate crimes since 2010, from when IndiaSpend’s database records hate crimes. The database is being launched in a new, interactive format today. 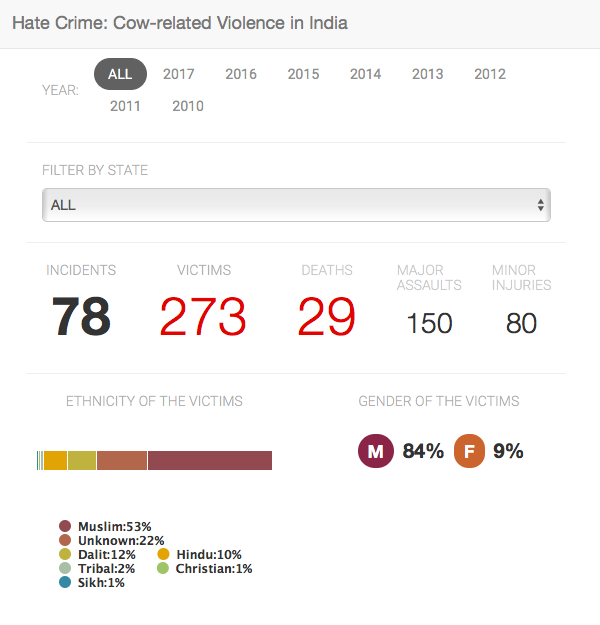 No incidents of hate crime were reported in 2010 and 2011, but over the eight years since 2012, 29 persons have been killed in cow-related hate violence, 25 of whom were Muslim. 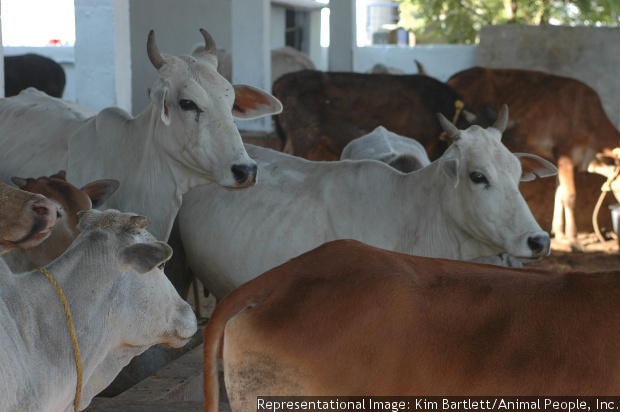 Until 2015, 76% or 13 of 17 cow-related hate crimes were reported from northern India. Since then, during 2016 and 2017 to-date, more incidents have been reported from the east, west and south of the country. The National Crime Records Bureau does not collect data on cow-related hate crimes, the Home Ministry told Parliament on July 25, 2017. Our database does. Explore data over eight years here. Our dataset includes the number of crimes committed each year since 2010, the severity of attacks and the reported cause of each incident. Most entries include the names of districts, towns and villages. Since each observation is based on a newspaper report of the crime, details such as the severity of crime, the number of victims and their identities and ethnicities vary. While reportage in cases of death has been fairly comprehensive, in cases where victims are injured, the details provided differ depending on the extent of news coverage available. Each crime is also geo-coded in the database. This is useful in viewing the geographic spread of such crimes and their concentration. 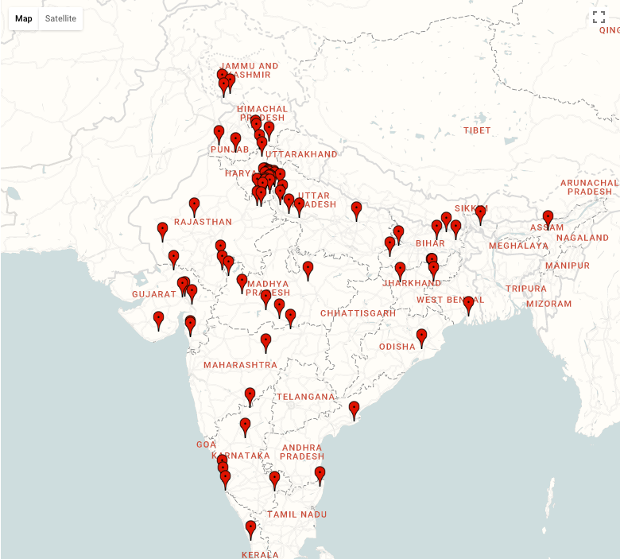 The database is an evolving initiative to record all hate crimes committed across India. Readers can report incidents too, which our team will then verify before adding them to the database. To access the database, visit http://data.indiaspend.com/hate-crime. You can view the geographical spread of hate crimes in ‘Map’ view or an index with brief descriptions of incidents by clicking ‘List’. The window will give details of the incident such as its date, location and brief summary. 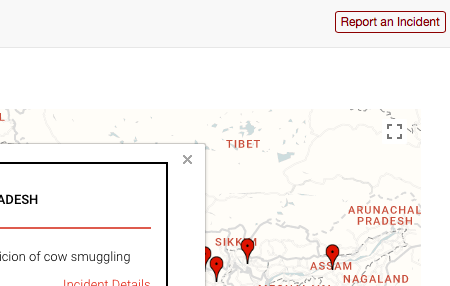 You can also click on the source of the incident as well as on ‘Incident Details’ at the bottom right to view further details. Incident details are categorised as ‘Cause’, ‘Action Taken’, ‘Victims’ and ‘Sources’. Besides viewing the incidents on a map or in a list, you can also filter your search by ‘Year’ and/or by ‘State’. For the filters selected, you will be able to view the numbers of: incidents, victims, deaths, major assaults, and minor injuries. The database also provides information on the identity of the victims, wherever available, including details on their gender, religion and/or location. Since maintaining law and order is a responsibility of the state government, the database gives information on which party was in power when the incident occurred. You can also ‘Report an Incident’ by clicking on the top right link. The information will be verified and, if found accurate, will be added to this database. 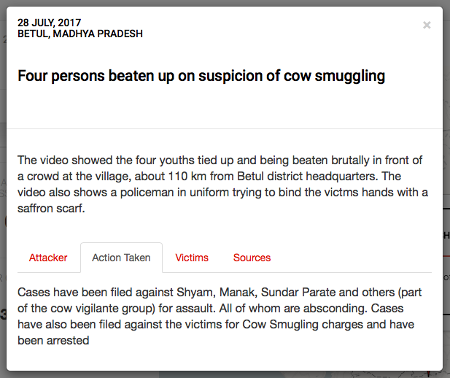 Our team gathered information about cow-related violence from 2010 onwards, and found no cases reported during 2010 and 2011. From 2012 until today, 78 cow-related hate crimes have been reported across the country. Most of these–97% of all incidents–have occurred over the last three years since the Bharatiya Janata Party and Prime Minister Narendra Modi assumed power in May 2014. Only one incident each was reported in 2012 and 2013. In the eight years since 2012, most of those killed–25 of 29 persons–were Muslim. Of all victims–killed or injured, whose identity was reported in news reports–53% were Muslim, 12% were Dalit, and 10% were Hindu. (Newspaper reports did not include the religious identity of 22% of the victims.) In a third of all cases–26 of 78 cases–the police filed cases against the victims under cow-protection laws. Geographically, from 2012 to-date, most cow-related hate crimes–64%, or 50 of 78 incidents–were reported in north India. Since 2015, the attacks spread towards the east and south of the mainland at an increased pace. Haryana and Uttar Pradesh, with 10 incidents each, reported the most number of crimes, followed by Gujarat where seven incidents have been recorded. Hate crimes are violent manifestations of intolerance against entire communities. They have a deep impact on not only the immediate victim but also the community with which the victim identifies, affecting social cohesion and stability, the Organization for Security and Cooperation in Europe (OSCE) said in its 2009 guide for framing hate crime laws. For more insight into the Indian context, IndiaSpend spoke to experts in criminal law and human rights. Attacks based on race, religion, caste or ethnicity in India often occur when the attackers believe that they have political cover and will not be prosecuted and punished, Meenakshi Ganguly, South Asia director for Human Rights Watch, an international non-governmental organisation, told IndiaSpend. “When religious/political leaders go on stage or television and urge followers to take up arms to protect the cow, they are not merely inciting a single individual to commit a single act of violence. They communicate a sanction inciting several followers to commit such crimes across the country,” senior advocate Colin Gonsalves, founder of the Human Rights Law Network, told IndiaSpend. This not only motivates violence, it also destroys law and order because the police become reluctant to prevent the crime and/or arrest the perpetrators, he said. 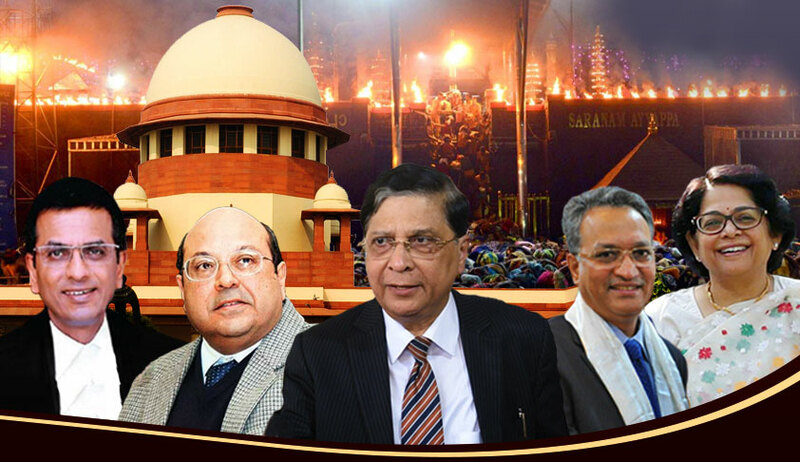 It is crucial for the state to respond immediately to establish the rule of law, and insist that any provocation or suspicion be handled by the criminal justice system and not through mob justice, Ganguly said. “Otherwise, people lose faith in the justice system, and there is risk of a cycle of revenge and violence,” she added. Even in cases where those attacked may have been illegally smuggling cows for slaughter and tanning, the law does not allow a disproportionate response to the infraction. “The response to seeing a crime committed is to stop the perpetrator and wait for the police to deal with her or him–not to take matters into one’s own hands–especially if the so-called criminal is unarmed and pleads, with folded hands, for forgiveness and for his life. Unless there is a parallel threat of violence, and it is an act of self-defense, such a response is not acceptable under any law,” John said. All the experts IndiaSpend spoke to said the political dispensation under which these crimes take place must be held accountable. “There appears to be some amount of political complicity in these attacks carried out in the name of cow protection,” said Ganguly, pointing out that in many cases–a third according to our database–instead of prosecuting the attackers, many of whom are allegedly linked to extremist Hindu groups affiliated with the ruling party, the police have filed complaints under laws banning cow slaughter against the assault victims, their relatives and associates. “You cannot look at these stark statistics alone without understanding the political linkages,” John said. She added that the increase in the incidence of such crimes reflects a lack of will to uphold the law. Gonsalves too believes religious and political leaders who instigate such violence must be strictly prosecuted. “They are the masterminds behind these murders and assaults. In law we call this person ‘the main conspirator’ which is a term often used in dealing with terror cases. To my mind this sort of violence is no different than terrorism–in fact it is terrorism of the worst kind,” he said. Many countries explicitly penalize hate crimes through their criminal justice system. Some have separate criminal offenses for violent attacks carried out with racist or other hate motivation. Others provide explicitly for higher sentences for violent hate crime. Using the data, citizens can get in touch with lawyers to help these people get justice. Through these lawyers, citizens may follow up on counter cases filed by assailants and the police against the victims of hate crimes, which prevent them from receiving justice. “This [database] has to expand and become more proactive and actionable. The legal system can be oppressive. 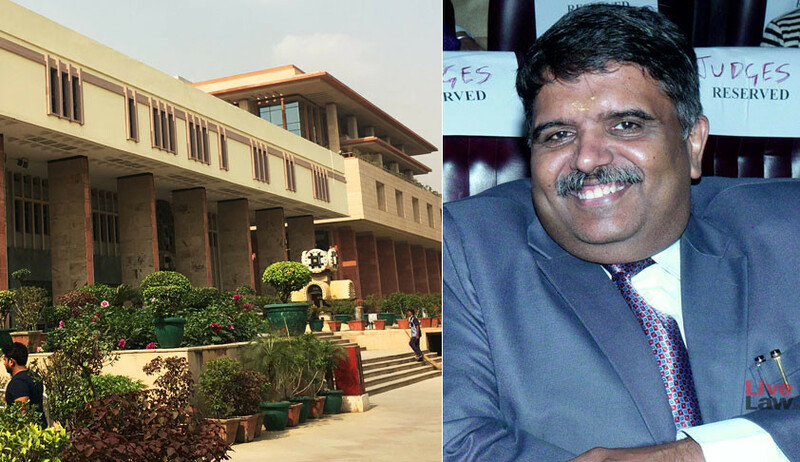 These cases of violence stay with the victims for a long time–very often when the prosecution sides with the assailants–victims do not receive justice for 6-8-10 years at a stretch,” Gonsalves told IndiaSpend. Saldanha is an assistant editor with India Spend.